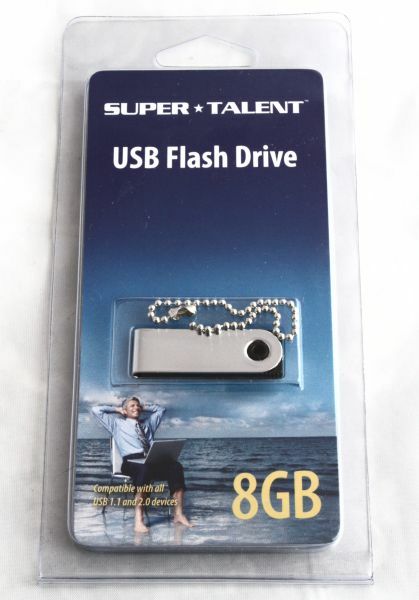 This month Super Talent added 8GB models to their Pico USB stick lineup, the firm claims these USB sticks are the smallest 8GB USB drives you can buy on the market. There are three different versions of the Pico drive, they are available in capacities from 1GB to 8GB and they all have their very small form factor in common. The Pico-A, which is the model I tested, measures 38.7mm x 12.4mm x 3.9mm and features a swiveling USB connector. The Pico-B features a retractable USB connector and measures 31.8mm x 18.8mm x 4.4mm and then there's also the rugged Pico-C that measures 31.3mm x 12.4mm x 3.4mm. All drives feature 200x transfer speeds (30MB/s) and the A and C model are water resistant. The USB stick ships in a rather standard plastic blister package and the only extra is a small keychain. Pico drives are available in capacities ranging from 1GB to 8GB. Flash drives are quite common storage devices these days as they make it very easy to transfer large quantities of photos, music, documents or even movies between two or more PCs. A couple of years ago I had to use rewritable CDs or DVDs for this task but since flash drives with a capacity of about 2GB became very affordable my DVD burner has been catching dust. USB drives are just way faster, easier to use and also much smaller. A DVD hardly fits in your pocket but most flash drives easily allow you to carry several gigabytes of data in your pocket or wallet. The Pico series from Super Talent is one of the flash drives that brings this to the next level, these drives aren't just small but ultrasmall. 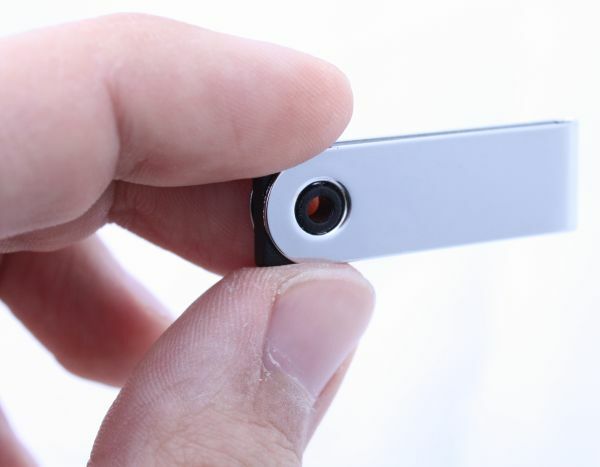 The Super Talent 8GB Pico-A is very compact, weighs next to nothing and is barely thicker than a coin. The Pico A features a swiveling USB connector that's housed in a shiny metal cover and as you can see on the photo with the euro coin the metallic shell collects quite a lot of fingerprints. The Pico lacks an activity LED but I don't think that's a big problem. Even though the drive is extremely thin it feels very solid, I don't think it will easily get damaged. The Pico A drives are also water resistant, I'm not sure if they will survive a trip through your washing machine but they should be well protected against water spills or rain. The size of the drive is great though.